The ACR83 'PINeasy' SDK from ACS is a detailed development kit allowing users to program applications compatible to the ACR83. The ACR83 is a USB 2.0 device with secure PIN entry facilities. This reader allows PIN entries to be made to the device itself rather than via a PC or workstation, removing the possibility of the interception of highly valuable information by a virus, trojan or USB sniffer. Approved to EMV level 1, the ACR83 can be used for a wide variety of high security applications and is one of the smallest PIN-pad readers in the market. Tools & Utilities -ACR83 Tool, this is an application utility tool that enables you to perform PC/SC commands such as controlling the device and its peripherals. -CardTool, this allows you to send commands to any ISO 7816 T=0 compliant smartcard. -QuickView, this checks for proper driver installation. Sample codes -Show the different capabilities of the ACR83 and showcase how to control the ACR83 peripherals and how to communicate with contact cards. -Delphi 7, Java, Visual Basic 6, Visual C++ 6, Visual C++ 2005 (x64), Visual C # 2005 and Visual Basic .Net 2005. Technical Specifications and Reference Manuals -ACR83 SDK User Manual, This manual educates the user on how to install the SDK and gives a brief description of the components included in the SDK. 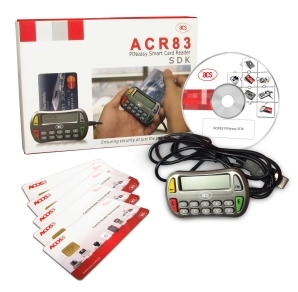 -ACR83 CCID Protocol, contains the commands that can be used to create applications using the ACR83 PINeasy Reader. -ACR83 SPE API, contains information about CCID Secure PIN Entry Data Structure. -ACOS3 Reference Manual, specifications for the ACOS3 MCU Card.